Good fences make good facilities, the best fence is sometimes one that is barely noticed. 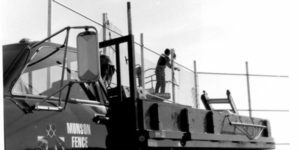 - Munson, Inc.
We pride ourselves in designing and building quality fences that go look and function great with our Tennis court construction. As this article from Tennis Industry Magazine suggests, sometimes, a fence that you don’t even notice is the best kind of fence. Fencing around your tennis court is something that rarely gets attention. After all, it’s not as showy as a surface, and it’s certainly not as interesting as the players. To a certain extent, having a fence nobody notices is a good thing. Unless something has gone very wrong with the fence, it should just be taken for granted that it’s doing its job: keeping balls in the playing area, keeping excess foot traffic off the surface and (if windscreens are used) helping to provide a windbreak and a heightened sense of privacy. That’s not to say, though, that fencing should be ignored. Far from it. It’s an amenity that needs upkeep and inspection to remain at its best. 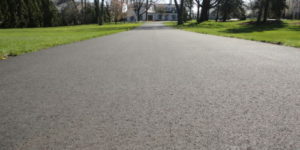 It is also a design element that can lend a great deal to the aesthetic of a finished court. 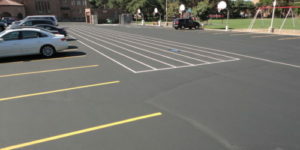 Fencing heights vary according to court location (for example, a rooftop court should have higher fencing, as should a court with a hard surface), player populations (beginners are more likely to hit a ball out of the court and therefore appreciate a higher fence) and design preferences. 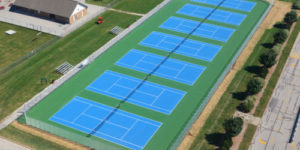 Various patterns for fencing are used in tennis court construction. All-around fencing has been a standard in many park and recreational installations, but some players (more often club players) dislike what they refer to as the institutional or “cage” feel and prefer fencing only behind each baseline and partially along the sidelines. Some courts have all-around fencing that encloses a battery of courts, but have movable netting between each court. Many players like the so-called “California corners,” a layout that cuts off each of the four corners of the court and reduces the number of balls that must be retrieved from deep in the corner. 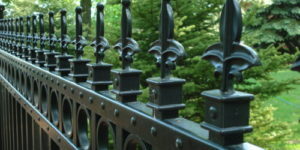 In addition to the traditional chain-link fence, fencing can be metal, wood, lattice or other ornamental material. 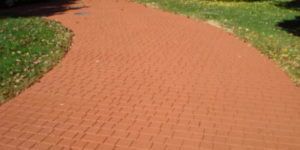 The type of material used will depend upon budget, design preference and more. Use heavy gauge chain-link fabric (nine-gauge core wire) to ensure the fabric will not bend or deform easily when hit by players or maintenance equipment. 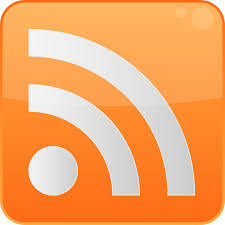 Install the fabric on the court side of the fence frame. This will significantly reduce the chance of a player getting injured should they run into the fence. 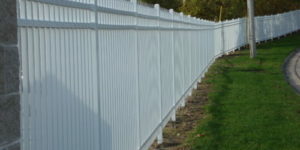 Provide a bottom rail in lieu of a tension wire to prevent the bottom selvage of the fence fabric from curling over time. Install 4-foot-wide gates to provide access for wheelchair tennis players who use sports chairs. 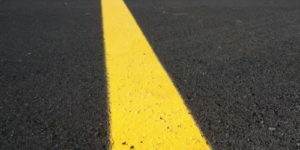 ‹ Fall Paving – Now is the time to act!